Sportswriting thrives on superlatives. Often praise is overblown, descriptions overhyped, feats overcooked. 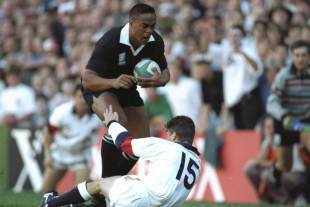 But in the case of Jonah Lomu, every superlative directed his way during his lush rugby career was deserved. Yes, he was the best winger and most inspirational player of the modern era. No other rugby player made such an impact on the international scene, or was the idol of so many. In New Zealand he will always be a god. In Australia, he was admired and feared. Numerous Australian players treated him as their hero, their motivator. Those who have no interest in rugby or only scanty knowledge of that strange 15-man code still knew one name- Jonah Lomu. They had seen the footage of his endless tryscoring feats- which often resembled a slapstick comedy with hapless midgets making fools of themselves while trying to bring down a rampaging gigantor. Footage that never can be forgotten. That he is gone at only 40 is mind numbing. I was so lucky. I was there when Jonah was at his prime on the football field, especially during the 1995 World Cup tournament where no-one, absolutely no-one could stop him, or even force the man in overdrive to go back a gear. Opponents became mere ineffective speed bumps. This 119kg 196cm colossus was in another league. That day at Newlands when he virtually defeated England by himself remains firmly lodged in my memory. The press benches at Cape Town were right behind where the England coaching staff were sitting. My notebook was virtually resting on the back of England coach Jack Rowell's head, and he didn't take too kindly to us laughing uproariously as Lomu scored try after try after try. The hapless England defenders were swatted away as if they were gnats, and were mere plastic cones, squashed and mashed, as he ran over the top of them. Mike Catt was one of many crumpled victims. Small wonder that during that tournament, one All Blacks supporters sent the team a telegram to their Johannesburg hotel, which said simply: "'Remember rugby is a team game so all 14 of you pass the ball to Jonah." For two decades, that has been my favourite rugby quote. Then there's the time Robin Williams, another genius who departed prematurely, met Jonah. The master comedian peered up at Jonah before telling onlookers: "Quickly! Tell the other villagers we go now!" For some years, Jonah was cocooned away from the Australian media. But that changed when John Hart took over as All Blacks coach, merrily organising interviews with the great man. And here we discovered the other side of Jonah. Such a devastating on-field force was so humble, quiet, self-effacing off it. He even appeared surprised by all the media attention, not exactly comprehending the effect he had on others. He couldn't really explain why he was so dominant. He just ran, ran, ran and hoped for the best. If people got in his way, so be it. He was an innocent, humorous kid just doing what he loved best- and it was impossible not to be enchanted by that. For so long, Jonah had been ill, seriously ill. But as he kept making public appearances, including leading a classic haka at Covent Garden before the start of the last World Cup tournament, you just felt he would continue to get over his trials. You firmly believed he was different, and that his super-human powers would work on and on. Sadly these powers eventually dimmed. This sporting phenomenon left us far too early, but will never be forgotten.